The COSMIC multidisciplinary multi-sectoral international training programme addresses scientific and transferable skills required to become a systems medicine professional equipped to tackle complex clinical challenges and to become key players in translating fundamental knowledge into clinical practice. COSMIC aims to better align research fellows with changing paradigms in basic and clinical research. Our research project training adheres to EU principles for Innovative Doctoral Training . Research fellows will be allowed to take responsibility for their research and career at an early stage supported by their Personal Career Development Plan (PCDP) and a self-assessment tool developed by the Dutch University Medical Centers that reflects the competences to be acquired during the project. 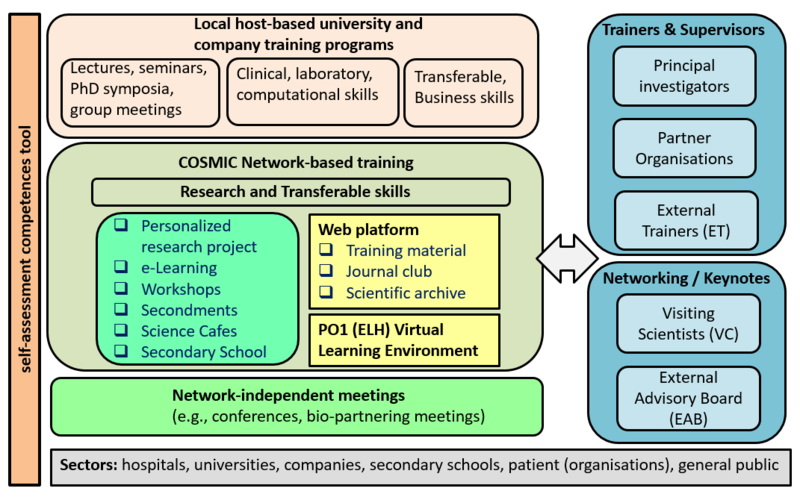 Figure: Overview of the COSMIC training programme. Public engagement: fellows will be trained to communicate their research to non-scientists. Transferable skills (e.g., scientific writing, presenting, industry/business). COSMIC offers online courses, workshops, science cafes, patient seminars, journal clubs, secondments, and annual research meetings to complement the training provided by the host institutes. This training programme will also facilitate face-to-face meetings to stimulate discussion, collaboration, and team building between the fellows, principal investigator, visiting scientists, external trainers, and external advisory board. Fellows more experienced in specific topics will support less experienced fellows and/or will be involved in teaching. COSMIC includes e-learning activities that are supported by a Virtual Learning Environment (video, webcasts, tests, quizzes) provided by Elevate Health and video conferencing (Skype/WebEx). COSMIC provides a web platform to support the preparatory e-lectures of the workshops. Fellows will be trained to critically read, evaluate, and explain research papers using video conferencing and the COSMIC web platform. The journal club will distribute two key scientific systems medicine paper each year among all fellows. One fellow will take the lead to analyse the paper before presenting it to the group at large. Papers will be discussed among all fellows after presentation aiming to generate new ideas for their research. The journal club facilitates further interaction between the fellows and PIs. We will organize two Science Cafes. Fellows will present complex research to non-specialists. A specific aim is to help researchers to better understand public interest in priorities for science and also the public's concerns. The Science Cafes itself will be organised during the evening in a cafe to create an informal atmosphere and will be open for all public. Patients and patient organisations, companies, and other stake holders will be explicitly invited. We organize two patient seminars in which patients and medical doctors give a lecture about disease signs and symptoms as well as socioeconomic consequences. Fellows attend and network/present at COSMIC-independent (inter)national scientific meetings In addition, to enable insight into the commercial side of life science and ventures of enterprise development the fellows will be prompted to visit and interact with commercial entities and innovative start-ups at bio partnering meetings. Involving secondary school and university programmes.COSMIC PIs and research fellows will incorporate systems medicine best practices, tools, and knowledge in (academic) education programmes contributing to sustainability and extension of systems medicine training.